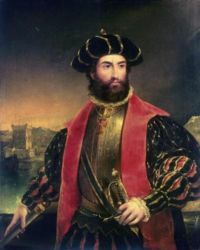 Vasco da Gama (1460-1524), commanded the Portuguese expeditions that opened the sea route between Europe and India by sailing around the southern tip of Africa. In three expeditions between 1497 and 1502, two of them led by da Gama, Portugal established the European presence in the Indian Ocean that would form the basis of a Portuguese empire, parts of which would last into the late 20th century. He was the son of a Portuguese knight, had received the education and training appropriate for his station, and it is thought he had studied navigation. It is known that at some stage he was successful when directed by King John II to seize French ships in Portuguese ports as compensation for piracy. Bartholomew Diaz had entered the Indian Ocean in 1488, sure that he had discovered the route to India, but was unprepared in both the capacity of his vessels and the enthusiasm of his crew for the hard work required to finish the journey. Diaz rounded Cape Agulhas, the southernmost point of Africa, and reached as far east as Algoa Bay in modern-day South Africa, but his crew mutinied at that point and Diaz was forced to return to Portugal. Diaz was a seaman and navigator – undoubtedly one of the greatest of his age – but larger forces under a more sophisticated commander would be required for a successful – and profitable – outcome. He was, however, asked to advise and assist in both the preparations and part of the voyage itself. Vasco da Gama was chosen to command a flotilla of four ships – two ‘’nao’’s, or carracks, a caravel and a store ship. For a variety of reasons nearly a decade had elapsed between Diaz’s return and the departure of the da Gama expedition. King John had died and a change of administration always meant delays. The negotiations regarding the Treaty of Tordesillas - which was to divide the world in two between Portugal and Spain – had been under way; and to complement Diaz’s exertions at sea, John had dispatched Pedro da Corvilha; in effect a spy; into the Muslim world of the Indian Ocean to gain intelligence in preparation for the voyage. Da Gama knew where he was going and what to expect when he arrived. The little fleet left Lisbon on 8 July 1497, followed the usual course of Portuguese mariners south to Sierra Leone, then, at Diaz’s suggestion, sailed southward away from the African coast (and its unfavourable winds and currents) out and away into the Atlantic until, nearing the latitude of the Cape of Good Hope, it turned eastward and made landfall about 300 miles north of the Cape. It took them nearly four weeks to round the Cape and pass Diaz’s point of return. They began moving slowly up the coast of present-day Natal, fighting the southerly Mozambique current; until on Christmas Day they stood out to sea. It is conjectured that from here da Gama had information as to what lay ahead and could proceed with confidence. From 24 January they spent a number of weeks by the Quelimane River cleaning and repairing the ships. Then, on 1 March, they reached civilisation - Mocambique - where they dined with the sultan and began negotiating the use of pilots - which were to mislead them at every opportunity. Here, skirmishes happened between da Gama and the locals. The Europeans were forced to fire on them; and da Gama made for Mombasa with (kidnapped) pilots. Mombasa was unwelcoming, indeed treacherous, so the fleet sailed the 70 or so miles up the coast to Malindi, Mombasa’s rival in the area. On 24 April 1498, after much diplomatic to-ing and fro-ing, ship maintenance, and with a competent pilot, the flotilla set off across the Indian Ocean heading for the trading port of Calicut on the Malabar Coast of southern India. Once there, da Gama found that the cloth and ironware so successfully traded in Africa were not in demand in the more technologically advanced India. He spent a year trying unsuccessfully to establish a permanent trade embassy in the teeth of Arab resistance, before returning home with a cargo of pepper and cinnamon; arriving in September 1499. Although returning with only two of his original four ships, and with only 55 surviving sailors out of his original 170, da Gama's voyage was quite profitable, returning with cargo worth 60 times the cost of the expedition. Another expedition, commanded by Pedro Alvarez Cabral left Lisbon within 6 months of da Gama’s return. After a disastrous voyage in which four of the ten ships were lost in a storm, Cabral faced many of the same problems as da Gama in Calicut, culminating in an Arab/Christian street fight. Cabral did manage to establish a factory down the coast in Cochin. In 1502 da Gama was back leading a well-armed and resourced fleet of 14 sail in India. He bombarded Calicut in retaliation for past troubles, defeated an Arab fleet in the first pitched battle fought by Europeans in the Indian Ocean, and gained favourable trading conditions at the point of a cannon; thus introducing the Portuguese policy of trade by force that was to see the nation in control of the lucrative eastern spice trade, and an empire stretching over the coastal areas of half the south and east of Asia for over a hundred years. In 1524 da Gama was sent back to India to replace an incompetent governor-general, but died of malaria in Cochin a few months later.